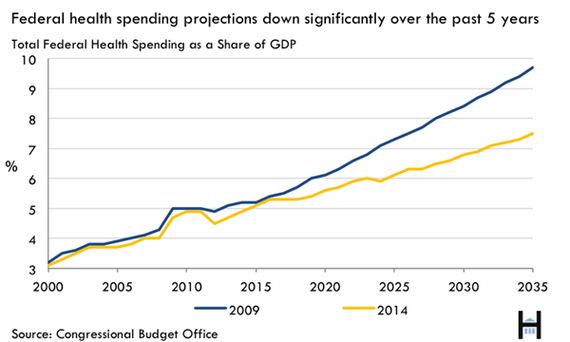 The blue line in the chart is projected health care spending over the next 5 years in 2009, the yellow line is actual spending through 2014. Just five years ago, with federal deficits soaring to record highs, it was easy to say that the future of U.S. healthcare would the undoing of our economy. It was predicted that health spending would dramatically outpace growth in the US and our cost of health care would become a greater chunk of our GDP then we could afford. As you can see from the chart above the forecast was off significantly but the forecast led to changes in health care most notably through the Affordable Care Act (ACA) or Obamacare. These predictions made the case for dramatically restructuring the way the government spent money on medical care and other services. Projections shared by responsible economists said federal healthcare spending was on pace to gobble up half of the budget within a few decades—or $1 in every $10 of GDP by 2035. Some analysts said that if we wanted to preserve our future, our very way of life, it was necessary to make deep, painful, and brave cuts to benefits. So guess what we did – just that in the form of the ACA. It’s also reasonable to say that the effects of Obamacare have not yet been implemented therefore the ACA is not the reason spending on health care is below predicted values. So what caused the prediction to miss the mark? Well that’s easy – a bad prediction. In most cases things are not nearly as bad as we imagine and not as great as we hope. It’s easy to be pessimistic when things are trending in a certain direction. New healthcare spending projections came out this past week and, as you can see in the chart above they tell a very different U.S. healthcare story today as opposed to what was predicted just 5 years ago. We’re now projected to spend hundreds of billions of dollars less on medical care that we thought in 2009. The Congressional Budget Office now says that healthcare costs will grow about 20 percent slower than they estimated just five years ago. Who knows why the predictions were off so much. I’d like to think hospitals and providers have done a better job controlling costs by limiting price increases and eliminating duplicate and unneccessary testing but I doubt we’ll get much credit. The one thing we know for certain is no matter what we predict for health care spending over the next 5 years, it won’t be as bad as we fear or as good as we hope. Predictions are hard but that’s what makes life interesting!